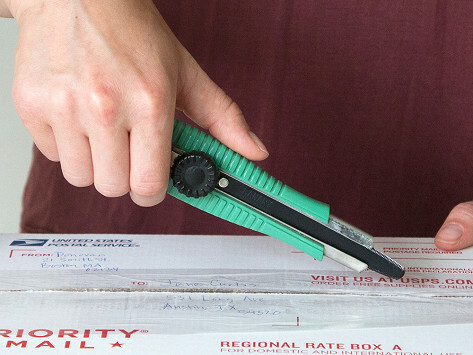 This serrated box cutter makes quick work of cardboard boxes, packing tape, and other shipping materials. The adjustable stainless steel blade is double-edged and non-stick to easily tackle the breaking-down job, while the rounded tip prevents damage to the goods inside. A locking ratchet-wheel lets you get the just-right cutting angle, too. Dimensions: 9.4" x 3.2" x 1.2"
One of the Coolest Inventions Ever! 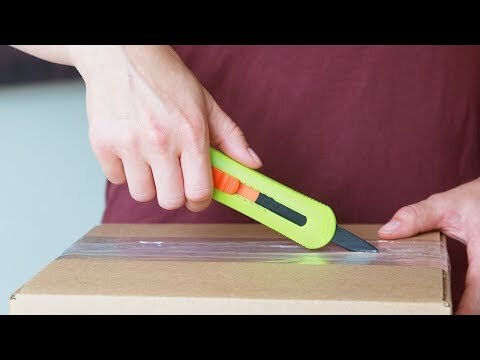 This box opener is the best I've ever had! Works like a charm! Love the ratchet feature and sawtooth blade! Not as sharp as I thought. The serrated box cutters from Canary blend utility with Japanese craftsmanship in well-made knives. The blades set them apart from the typical ones. The fine, sawtooth, stainless steel edge takes down cardboard boxes and packing tape. Because they’re edged on both sides, you can cut upwards or downwards. And the smooth, rounded tip prevents unwanted damage on the goods inside the box. The blades adjust to get the just-right length to tackle boxes, packing tape, straps, or even to remove labels. The non-stick coating keeps adhesives from gumming the blades up. Each knife is made in Seki, Gifu, Japan, an area renowned for its long tradition of knife and cutlery craftsmanship. This heritage is apparent—these handy blades make everyday cutting tasks a lot easier.